Frustrated by the comatose silver price? Tired of it going nowhere and being held down? Well, history has a message for you: This trading behavior is normal. Furthermore, similar scenarios from the past say the next price explosion is on the way. I know from past studies that silver doesn’t always shoot up when gold does, in spite of the fact that it almost always gains more than gold before the uptrend is over. I decided to put the data to a chart and see what it showed. I listed gold’s five biggest bull markets, then added silver’s performance to see how closely it tracked gold throughout the uptrend. What it showed confirmed my suspicion: Silver usually (though not always) trails gold in the beginning stages of a bull market. Take a look. In three of gold’s five biggest bull markets, silver clearly trailed the gold price in the beginning stages. It caught up and eventually surpassed gold’s total return, but it usually got off to a slower start than gold. Sound familiar? 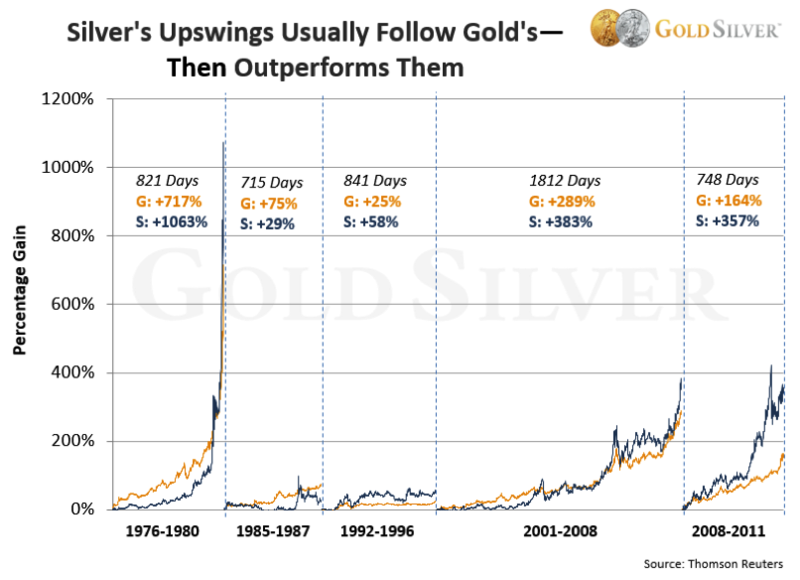 In the 1992-1996 and 2008-2011 markets, silver did advance with gold and even jumped ahead of it fairly early in the trend, but in the other three bull markets it lagged until later. So we have historical precedents for silver’s current price behavior—remaining flat while gold creeps higher. In other words, what we’re experiencing now has happened before. Since precious metals bottomed in December 2015, gold has risen 26% (through April 20), but silver has only gained 24%. Gold has advanced 3.4% YTD, but silver is up only 1.3%. This is all very similar behavior to three of the bull markets listed above. But you can also see this lag in performance is only temporary: As history shows, silver has outperformed gold in every major modern-day precious metals bull market (though it did fall below gold before the mid-1980s uptrend ended). There is no reason to expect this won’t be the case the next time around. Although the gains vary widely, silver’s average advance was 378%. But since Mike is calling for a new world monetary system within two years, silver’s gain will be anything but average. It’s more likely to resemble the latter half of the 1970s: add a zero to the price (and your net worth). This data signals that we should hang on, and not fret silver’s lackadaisical price behavior. We already know from history how this story ends—silver will sell at multiples of what it sells for today. Mike and I and everyone else at GoldSilver continue to buy silver while it’s deeply undervalued.